I Have A Baker's Cyst: Should I Worry? - Jeffrey H. Berg, M.D. A Baker’s cyst (sometimes called a popliteal cyst) is a walled-off collection of gelatinous fluid in the back of your knee. It typically is found at the crease of your knee off center towards your other knee. Typically these cysts are the size of a large grape but they can range from even smaller than that to much larger. Baker’s cysts are usually painless and found in the midst of an evaluation for some other issue. Occasionally they can be symptomatic. When larger, they can press on adjacent structures and cause local pain. Sometimes they can get so large, that like an overfilled water ballon, they can burst. In these cases, the liquid they contain may drip down your leg. This may cause quite a bit of swelling and subsequent leg and ankle pain from the increased fluid. Baker’s Cyst: Do I Need To Worry? Mostly, however, these are asymptomatic. Most importantly, they are benign and so they should not be confused with a tumor or cancer. Furthermore, they don’t turn into cancer. Other than the rare occasion, they usually are not even symptomatic. As a result, they usually don’t require any treatment…or even any observation. So if you have a Baker’s cyst, and it’s not causing you any symptoms, you can usually just forget about it. Baker’s cysts can develop in children spontaneously, without any cause or other associated problem. This can also be the case with adults but it is much more rare. 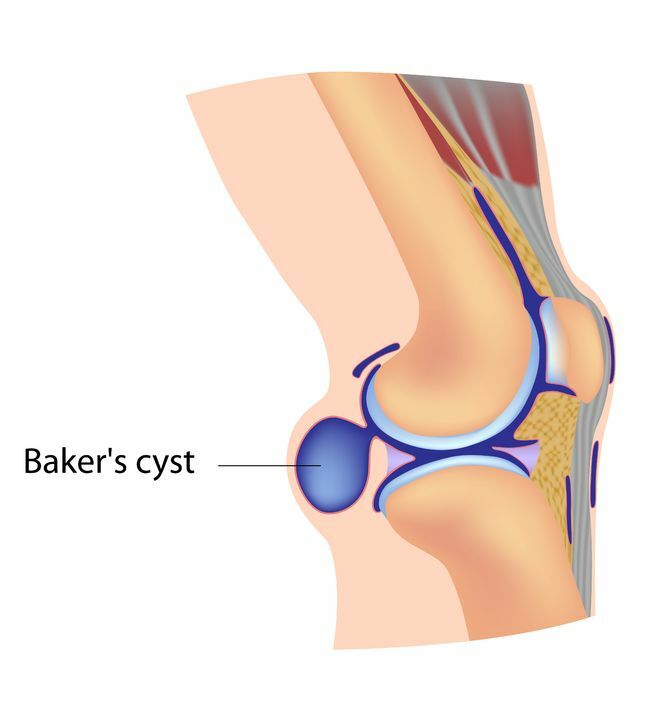 Usually in adults, Baker’s cysts are a sign of other issues in your knee. Typically a meniscal tear or knee arthritis causes increased swelling and fluid accumulation in the knee. This fluid increases the pressure in the knee. As a result, some of the fluid bulges out a weak spot in the back of the knee and this bulge produces the cyst. Baker’s Cyst: Does It Need Treatment? So although a Baker’s cyst in itself is usually not a cause for concern, it often means that there is a problem in your knee that may need to be addressed. In those rare cases where the cyst is bothersome, the liquid within it can safely be removed with a needle and the use of ultrasound for guidance. However, be warned, until the underlying problem is treated…and the excess knee fluid is no longer being produced, the cyst is likely to recur. If you have been told that you have a Baker’s cyst, you really don’t have to worry about the cyst…It’s benign…Not cancer. But it may be a sign of a problem within your knee. So if you have a Baker’s cyst and you’re having knee symptoms, it’s a good idea to see your knee doctor and get an evaluation. An ultrasound is a good way to confirm if a cyst exists. Usually in arthritis, a cyst means that there is a lot of fluid in the knee. To get rid of the cyst, if symptomatic, usually the fluid in the knee must be reduced if possible. Good luck! My doctor has advised me to have my bakers cyst removed. Will this mean a stay overnight in hospital? Usually not but it would depend on your overall health and specifics about your knee. I suggest asking your surgeon. Good luck! I had an MRI without contrast. I have a bakers cyst in the left knee. The radiologist noted that all ligaments were intact with bakers cyst present.. How am I to know what caused it.. The inside of my knee is so painful and I can’t bend it or straighten it due to the pain. It’s getting worse. And the inside of my knee hurts really bad to the touch. I’ve been limping for several months. This is the reason for the MRI. I am already taking several medications including anti inflammatory medications.. What could be wrong if he didn’t note arthritis or ligaments torn? Tonya, Hard to say from here, particularly without examining you or seeing your MRI. One thought that comes to mind if no arthritis or meniscal tear, is Lyme’s Disease Arthropathy (if you live or have traveled to an area where it exists) or some other type of inflammatory arthropathy. In these cases often the X-rays/MRIs can be normal except for excessive joint fluid. I suggest that you discuss these with your doctor. You may need to be referred to a specialist (i.e.. Rheumatologist, Orthopaedist, etc.) Hope that helps.